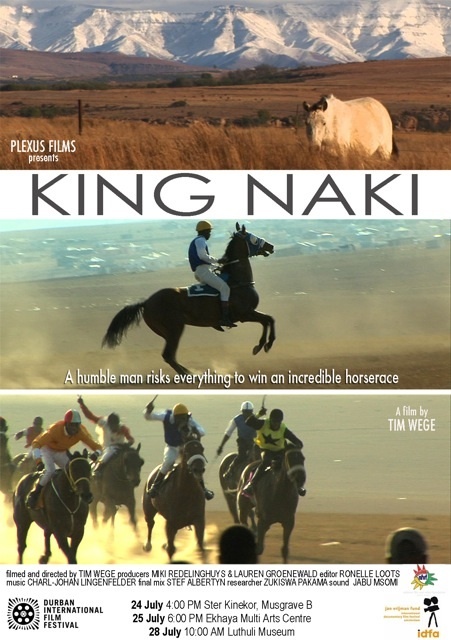 Set in rural South Africa, KING NAKI is the story of an unconventional horse race and a humble man risking his livelihood to win it. Mr. King Naki once rode the greatest racehorse in the whole of his region. He was raised to follow in his father’s footsteps, working as a stable hand in the city. But he had bigger plans. He quit the stable, spending all his savings on a horse. His fellow-villagers thought he was crazy to blow his money on a horse. He named the horse “Thula Sibone” – Wait and See. KING NAKI tells the story of a man’s obstinate persistence in the face of failure – pursuing a dream of wealth and victory to escape the treadmill of poverty.